It wasn’t that long ago when we brought you the news that Apple had set up a dedicated charitable giving page using their iTunes payment infrastructure to collect donations from the public on behalf of the American Red Cross. The system was put in place to allow Apple account holders to make a financial donation to the charity to help with the ongoing relief efforts as an aftermath of Hurricane Sandy without the need to create any additional login or provide payment data to external parties. In an internal email sent to Apple employees, Tim Cook has outlined his company’s commitment to the cause with a $2.5 million donation of their own. Hurricane Sandy is one of the most powerful hurricanes that has been caught on record and has been causing havoc on the east coast of the United States over the last week or so. Apple has already taken initial steps to provide a platform and a gateway to collect financial contributions from the public, 100% of which have been donated to the American Red Cross. Tim Cook outlines in an email that the general public and various Apple employees have already donated a substantial amount to the cause from their own pockets, but that he feels the company as a whole can "always do more". Apple may be on something of a product release marathon, with the iPad mini and fourth-generation iPad hitting shelves recently, as well as the new iMac to fall in the coming weeks, but it all pales into insignificance when you consider the devastation that has been left behind by Sandy. Lives have been lost, communities have been destroyed and countless families are still left without any kind of power in the worst hit areas. The human loss doesn’t take into account the billions of dollars worth of infrastructure damage that has also been created by the hurricane. As part of their bit to do more as a company, Apple will donate $2.5 million to the relief efforts that are being handled and orchestrated by the wonderful American Red Cross charity. 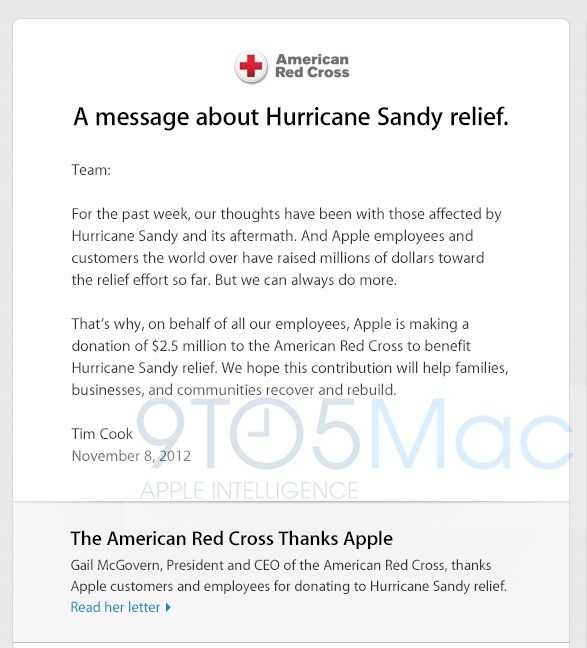 The email outlines Tim Cook’s hope that the donated money will help "families, businesses, and communities recover and rebuild". The rebuilding process will take far more than the amount of money raised and donated by Apple, but in a world where companies have historically used disasters like this to attempt to gain self promotion, it’s great to see Apple doing nothing more than injecting cash into the relief fund.